As China continues to push forward its military reform to achieve modernization in an unpredictable and volatile international security environment, the country is likely to see a steady increase in its defense budget in 2019 to about 1.2 trillion yuan ($179 billion), Chinese military experts said Monday. The figure is expected to be released at China's annual two sessions in early March. It is reasonable for China to increase its defense budget as its economy grows, analysts said. Constant increases in the defense budget are beneficial to maintaining the combat capability of the People's Liberation Army (PLA) by modernizing its weapons and equipment, a military expert told the Global Times on condition of anonymity on Monday, noting a stable 8-9 percent increase from 2018 would be a reasonable prediction. Echoing the expert, Wei Dongxu, a Beijing-based military analyst, told the Global Times that China's 2019 defense budget will be around 1.2 trillion yuan, and the increase will not likely exceed 10 percent. The 2018 defense budget was 1.11 trillion yuan, an 8.1 percent increase over 2017's, the Xinhua News Agency reported in March 2018. The report to the 19th National Congress of the Communist Party of China clarified the goal of China's military progress: "By the year 2020, military mechanization will be basically achieved, with IT application coming a long way and strategic capabilities seeing a big improvement." 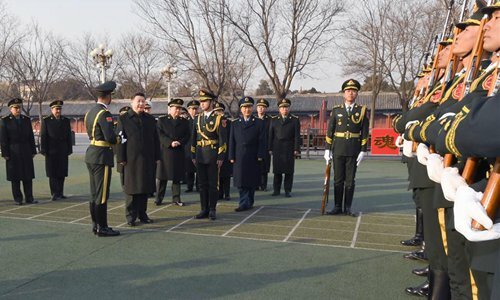 The report also mentioned that by 2035, the modernization of China's national defense and forces will be basically completed; and that by the mid-21st century the armed forces would be fully transformed into world-class troops. The increase went mainly to the development of weaponry and equipment, the improvement of training conditions, military reform and troop salaries and benefits, the PLA Daily reported then. The same will also apply to 2019, analysts said. China still has much catching-up to do in terms of weapons and technologies, because Chinese weapons were less advanced in the past, Wei said. Maintaining in-service weapons can also be costly, Wei said, citing a second aircraft carrier in the PLA Navy this year to take care of. While China has developed advanced weapons like the J-20 stealth fighter jet and Type 99A main battle tank, their numbers are limited and many PLA forces are still operating outdated weapons like the J-7 fighter jet and Type 59 tank. The anonymous expert said that the military reform has led to more frequent training to boost combat capability. Munitions and fuel also require funding. As prices of goods rise in China, the salaries of troops must rise accordingly, Wei said. Another reason behind the experts' prediction is the external security environment China is facing. The US has been sending warships to the South China Sea and the Taiwan Straits; Japan is converting its Izumo-class helicopter destroyers into aircraft carriers; and the advanced US stealth fighter F-35 is being sold to South Korea, Japan and Australia. The Chinese military must have enough money to deal with these challenges, experts said. Even with the potential budget increase, China's military expenditure remains far lower than that of the US. US President Donald Trump agreed to a request to propose a defense budget of $750 billion for 2019, and US defense officials said anything under $733 billion would increase risks, CNN reported in December 2018. 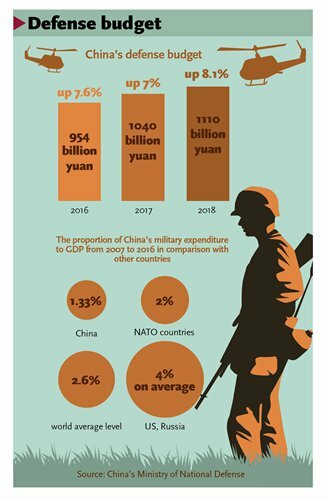 Data gathered by the PLA Daily shows that China's defense budget was only 1.33 percent of its GDP during the 2007-2016 period.This is significantly lower than the world average of 2.6 percent, not to mention those of the US and Russia, which are around 4 percent. But the US has been seeing China's military budget as a threat to its and its allies' security, analysts noted. The huge gap in these amounts shows that this "China threat theory" rhetoric is only an excuse the US uses to boost its own defense budget for global military dominance, which poses a huge challenge to world peace and development, starts an arms race and forces other countries to increase their military budgets, the anonymous expert said.